Bacteria display a diverse array of exotic sugars that are absent from humans. These sugars play a crucial role in infection and bacterial survival. Based on the experience obtained at MIT with inhibitor development, protein expression and enzyme activity assays, a solid chemical biology research line dedicated to bacterial glycobiology is being stablished. Enzymes involved in bacterial glycoprotein synthesis, and the biosynthetic machinery to make bacterial carbohydrates will be central to this research line. We are currently investigating the glycoprotein synthesis machinery from Haemophilus influenzae, Pseudonomas aeruginosa and Neisseria meningitidis, to understand their molecular mechanism as a basis for novel antibiotic therapies. 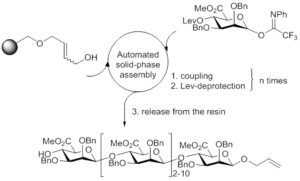 The production of oligosaccharides is still far from straightforward, especially when compared to peptides and nucleotides. Several projects in the Walvoort group are devoted to the development of novel methods to synthesize oligosaccharides, based on chemical, enzymatic and automated methods. We aim to produce oligosaccharides from both human and bacterial origin, and use them in biological studies to understand their structure-function relationship. Next to generating novel methods and pure oligosaccharide structures, these projects aim to contribute to our understanding of the immensely diverse world of natural carbohydrates.